YOUR SOURCE FOR CUSTOM SCREEN PRINTED POSTERS IN NEBRASKA AND BEYOND. Fill out our nifty form below to get a quote for your rad poster project! We have a 25 poster minimum and these are our typical print runs. All poster orders are subject to an over or under print run (accidents happen). For a custom quantity, mention details in the description section. To learn about our artwork fees, check our F.A.Q. in "The Basics" tab at the top of your screen. Also download our art specs from our handy documents page. I have nothing. Please create something awesome. Feel free to list pantone colors if applicable. 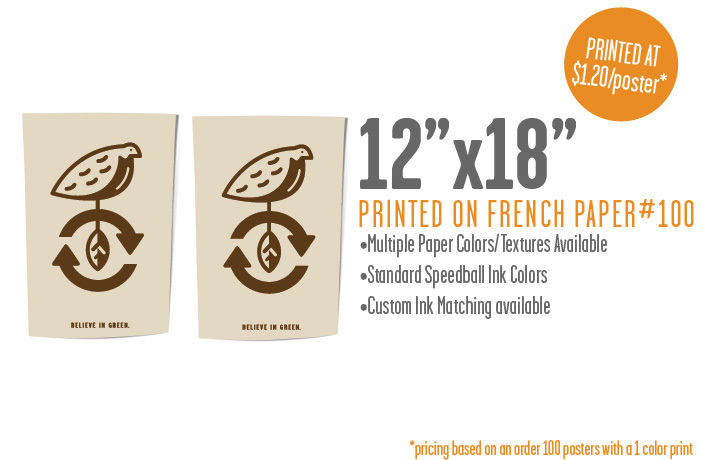 These take time to order and/or mix and can influence our turnaround time. We typically stamp the backside of all of our hand pulled screen printed posters as our "proof of authenticity". Please specify if you would like us to leave the back side blank. Also, please specify if you would like us to number your prints for you and if so, what location (i.e. front or back at bottom left or right corner). Thank you! Your form was magically sent through the interwebs and will be reviewed shortly. We look forward to working with you and will be in touch.